By the end of the day, six long-distance trains had to be cancelled, and 14 had to be diverted. The Mumbai Rajdhani had to be diverted via Agra and Bhayana and was delayed by 2-3 hours, officials said. Many other trains had to be delayed as a ripple effect. 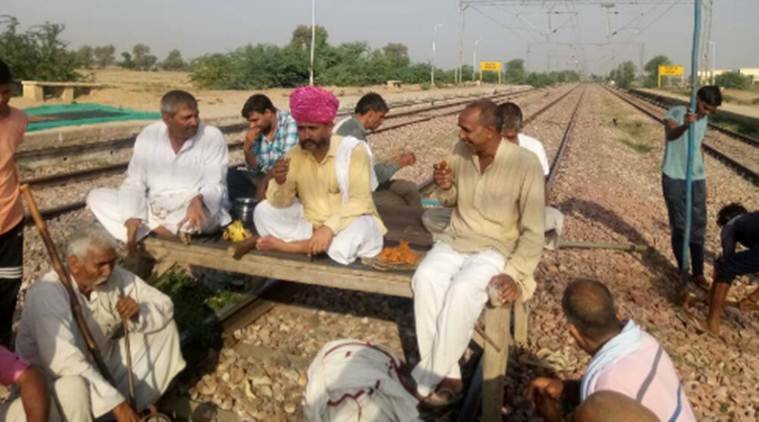 Eighty trains across northern and western parts of the country were affected on Friday after protesters demanding reservation for Jats sat on tracks in six locations in Rajasthan. The busy Delhi-Mumbai route was shut down for most of the day. By the end of the day, six long-distance trains had to be cancelled, and 14 had to be diverted — including the Mumbai Rajdhani. By Friday evening, as many as 26 trains stood directly affected by the protests. The Mumbai Rajdhani had to be diverted via Agra and Bhayana and was delayed by 2-3 hours, officials said. Many other trains had to be delayed as a ripple effect. The six spots where the stir intensified from Thursday evening were in Agra and Kota divisions of North Central Railway. By Friday afternoon, the Railway Board cancelled trains such as Nizamuddin-Kota Janashatabdi, and Jaipur-Lucknow Express. Ferozepur-Mumbai Central Janta Express was terminated in Delhi; Patna-Kota Express was terminated in Mathura. “Traffic was heavy because of the Eid holiday. So we wanted to keep the number of cancelled trains to a minimum,” a Railways spokesperson said. Four more spots, especially one at Jajan Patti railway station in Uttar Pradesh near the Mathura-Palwal main line, were still blocked, with negotiators from the administration and railway police holding talks with the protesters.